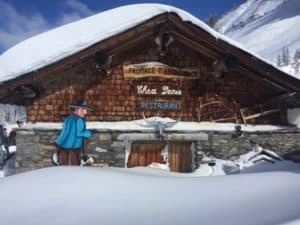 The fabulous restaurants around Châtel are a wonderful draw to the region and are a great excuse to travel around the Abondance and neighbouring valleys, whether in summer or winter. In July and August you are surrounded by the greens of alpine pasture and tall pine forest, with warm summer air insisting that you enjoy the outdoor terraces. In the depths of winter, with snow piled feet thick on chalet roofs and seasonal icy passageways to any entrance, the warmth of cosy interiors is a welcome not to be ignored. Of course part of the fun of the winter experience is also in revelling in those bright blue-sky days and returning to the same summer terraces, just this time clad in ski wear! 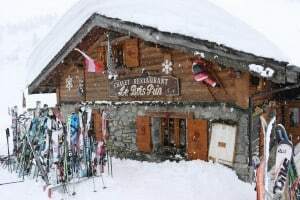 One of the lovely aspects of skiing in Châtel and the Portes du Soleil region is that lovely chalet bars and restaurants serving great food can be found all over the mountains, not just in the villages. Here are some of our favourites but why not come and visit and discover yours - there are so many more to choose from! Regular visitors to Châtel know well the Plaine Dranse area, filled with great lunch spots and located half way up the mountain from Pré-la-Joux, between the Pierre Long and Rochessons lifts. Chez BaBeth is a well known favourite here, with a unique ambience, best described as somewhere between Christmas and Valentine’s day with sheepskin rugs and decorations in abundance. The neighbouring Le Bois du Pin has been a lovely warm hide out for us on several wintery days and, like an alpine Tardis, can squeeze in so many more tables that one could imagine. Sitting just above on the hillside is Chez Denis with a heap of awards decorating the entranceway. Sit down here, hang your gloves over the stove and relax with a glass of wine and some traditional Savoyard fare. 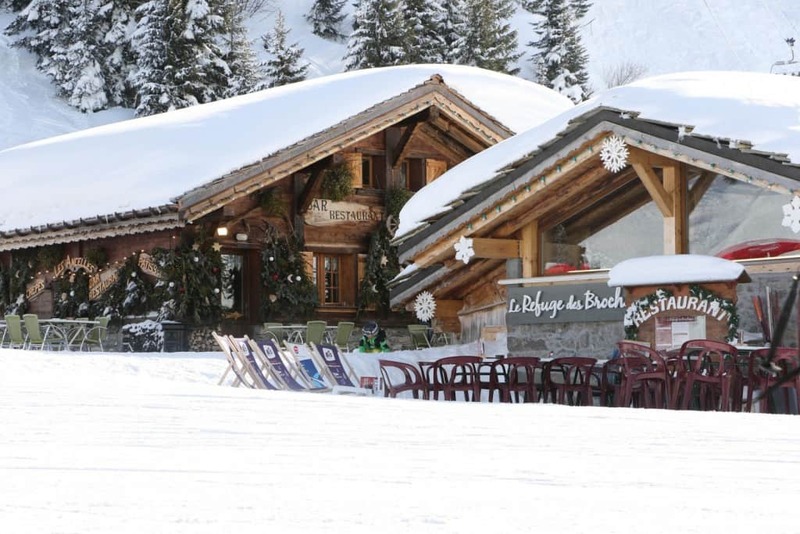 On the opposite side of Plaine Dranse, La Pierre aux Loups boldly advertises their takeaway pizza, but inside you discover a very popular and traditional chalet with all the savoyard specialties that you would desire. Continue up the Rochessons lift and ski down towards Les Lindarets (remember you need a full Portes du Soleil lift pass!) with a turn off to the right towards Ardent, and you will arrive at the marvellous Village des Chèvres (Goat Village). This is a fantastic place with bars, restaurants, outdoor terraces and a lovely spot for Savoyard gifts too! We would recommend that you visit them all but our favourite is probably La Terrace, overlooking the snowy valley on a sunny day. 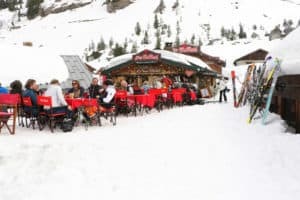 The resort of Avoriaz has plenty of bars and restaurants to choose from and a few words here could not do them justice. However, if you are skiing down from the high slopes above the Fornet bowl, stop off at the coffee bar towards the bottom of the bowl, lounge back on a deck chair and soak up the sunshine with the mountains surrounding you. Marvellous! Change the perspective and sit on top of the mountains above the bowl and gaze at the majestic Dents du Midi at the Pas de Chavanette restaurant, and observe the nervous skiers contemplating the infamous Swiss Wall. Returning to the Châtel side of the the mountain there are several other great places to stop for a spot of lunch or a pick-me-up during the day. Up above Plaine Dranse, Chalet du Blattin can be found half way down the blue “Les Blattins” run from the top of Comebois or Chaux-des-rosées. Les Combes, with a fabulous terrace overlooking the valley, is on the neighbouring piste of the same name. Stop here for some seriously generous chocolat chaud! Skiing round to the Super-Chatel area one can find several hidden aways places too. For a peaceful spot with a bustling restaurant it is worth going up and over the mountain towards Morgins and Chalet Neuf. Nearer to the village and at the top of the Châtel bubble is L'Escale, an easy spot to reach for non-skiers and a great indoor restaurant and outdoor terrace. Back down the hillside and along the main street are a great collection of eateries. 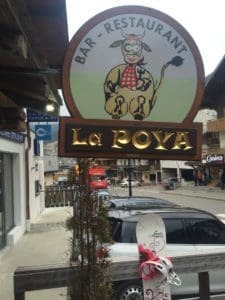 La Poya (celebrating the annual movement of cattle up to the summer pastures) provides a fantastic evening of great food in a relaxed setting. Le Vieux Four, situated just below the bubble, delivers marvellous meals in a more formal environment. Just above the main street, Le Fiacre is always busy and serves a wide variety of local and international dishes. A few doors down towards the church is La Reserve, a fun and vibrant restaurant in a contemporary setting. They are all very welcoming of children and great destinations for a mid-week dinner. If you feel adventurous and want to explore the other villages of the Val d’Abondance, the first stop of many would be in La Chapelle d'Abondance where you will find the ever popular Les Cornettes. A local favourite for many years. And if all of the above have not satiated your appetite there are adventures to be had on the way to your dinner table too. Why not set off on an evening snow trek up to a refuge for a traditional Savoyard fondue? Or book a table at Chalet de Théo and hike up from Petit Chatel towards the Col du Saix after sunset. Great ways to add a twist to your evening's entertainment! Follow the links to find out more about the luxurious accommodation that we offer at Clarian Chalets and the fabulous offering for families and friends. We look forward to welcoming you and helping you enjoy the best of the Châtel.